Behind the storm and fury of Hurricane Nate, preservation news was bubbling around the state and not in a good way. Thankfully, so far it seems that Nate’s damage on the Mississippi Gulf Coast was minimal, and I haven’t heard of any historic buildings that were affected there or inland. The two photos I’ve seen in most media outlets are of a small wooden gazebo knocked off its foundation on the beach and a boat that sank at the sea wall. If you know of any historic building damage, let us know in the comments. 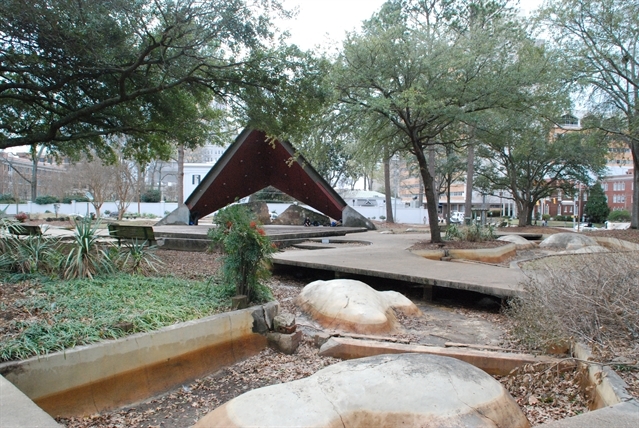 The proposed partial demolition includes the removal of the concrete waterway within the park and the leveling of earthen berms to be used as fill material for the concrete waterway. 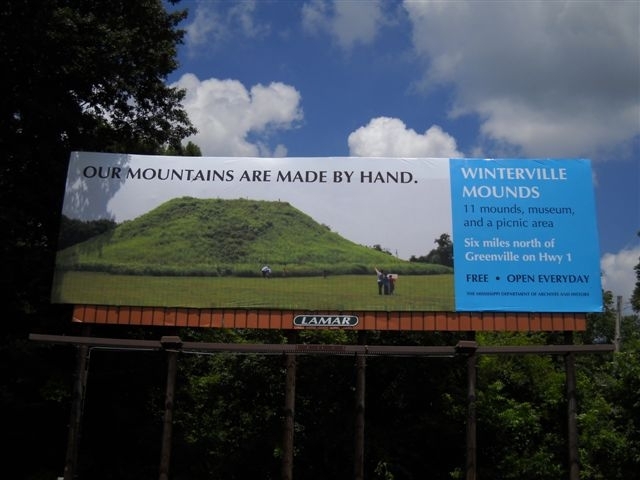 The [MDAH] Board of Trustees invites public comment on this proposed undertaking. Comments and requests for more information should be sent to Mr. Jim Woodrick, Director, Historic Preservation Division, MDAH, P.O. Box 571, Jackson, Mississippi, 39205-0571 within fourteen (14) days from the date of this publication [i.e., by October 19]. As I said last year, one of my favorite lunchtime activities in Spring and Fall used to be sitting eating my lunch in Smith Park at the convenient tables next to the concrete river. For a while, the river was not working due to a broken pump, but I still ate in Smith Park on nice days, enjoying the shade and the sun and the sights and sounds. Then, the river got fixed but I noticed that the concrete tables that also had chess boards on them started getting broken and not getting replaced. With fewer and fewer tables or seats to sit on, I would occasionally go and not be able to find a place to sit, so I started to find other places downtown to enjoy my lunch. Now I think there aren’t any tables left. This is how lack of maintenance leads to lack of occupancy of a public place and then to the invariable calls for major intervention or demolition. And that leads us to the next story . . .
Fire Marshal Mike Chaney, who is also the insurance commissioner, said he made the decision to close the Eudora Welty Library to the public after an inspection Wednesday. The violations include obstruction of exits and building stairwells, non-working emergency and exit lights, exposed wiring, a lack of fire evacuation plans and lack of a working fire sprinkler system. Chaney said the library will remain closed until the violations and conditions are corrected. What’s strange in this video is that around 12:30, director Patty Furr says she’s “fixed all the violations” that Chaney cited in closing the library. Then Chaney says that another problem is the elevator and then starts talking about how the building needs to be condemned because there’s cracks in the bricks and “bricks coming off of it” and that “once you get mortar integrity that disappears from the bricks, there’s not much you can do other than rebuild the building or tear it down.” I’m pretty sure this is a concrete structure with brick veneer, so I think Mr. Cheney should stick with advice about roofs, which he seems to know more about. “Repointing” is a regular item of maintenance on a building of this age, not a reason to condemn a structure. I’m not denying the Welty Library needs emergency attention, but it wouldn’t be an emergency if the leadership–county, city, and library system–had first gone after the contractor when it became apparent that the roof was not properly installed and second, fixed the other minor problems when they were still minor. To now say the building needs to be condemned and a “brand new” library take its place is a pipe dream. Y’all couldn’t handle this building or even a routine roof replacement, why should you be entrusted with a new, multi-million dollar one that you also won’t maintain? Fix the roof, fix the elevator, fix the sprinkler system, and reopen the state’s busiest library! Ok, on to, well, not necessarily better news, but at least evidence that some people in this state still believe in maintenance, albeit long-deferred maintenance. 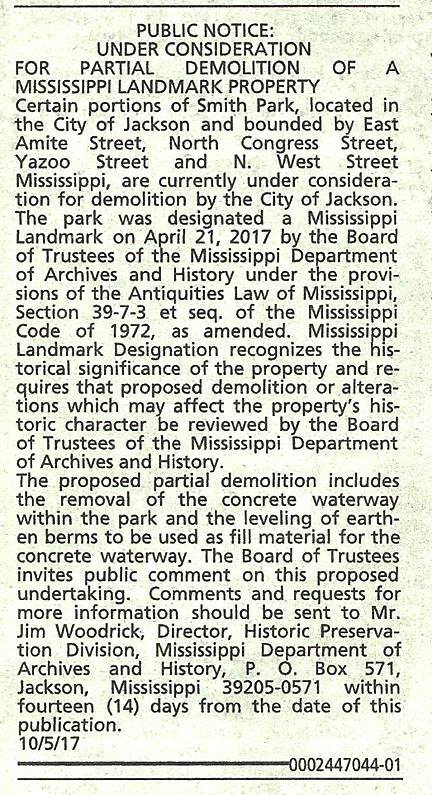 The Mississippi Department of Archives and History announced on their webpage that the Windsor Ruins Stabilization Project is underway. 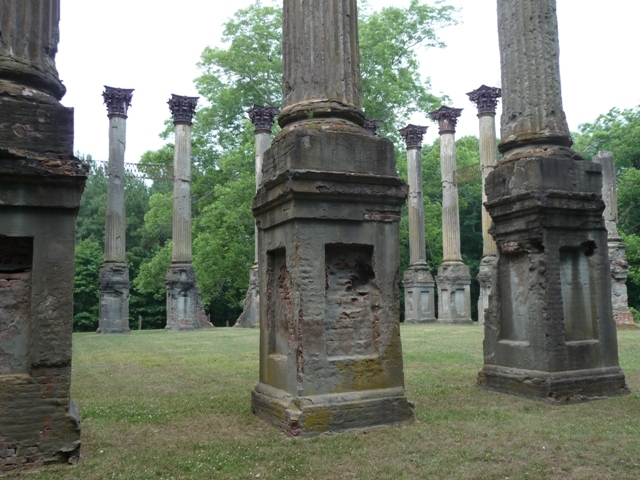 The Mississippi Department of Archives and History is taking steps to stabilize and preserve the Windsor Ruins site in Claiborne County. More than a century of exposure to the elements has caused erosion to the 45-foot-tall masonry columns and fracturing of the cast iron capitals. In 2016, MDAH commissioned architectural conservator George Fore to study the site. Fore’s report, submitted to the department earlier this year, includes recommendations to repair and conserve the twenty-three columns and five partial columns. At its September teleconference meeting, the MDAH board of trustees selected WFT Architects, P.A., to develop architectural plans for the stabilization project. Lawson Newman, the project architect for the restoration of the Mississippi State Capitol, will serve in that same role for the Windsor stabilization project. Newman was the project architect for the restoration of the Medgar Evers House Museum in Jackson and the exterior restoration of the John W. Boddie House at Tougaloo College. Recent improvements at Windsor include cutting back trees and foliage that were encroaching on the columns, clearing the overgrown area between the site and the road, and the installation of new signage. Temporary fencing has been erected to protect visitors at the site from falling debris. “This metal fence will have a minimal impact on the view of the Ruins while keeping the site safe and accessible for all,” said Blount. I know this blog is not about grammar, but it breaks my heart to have state agencies contribute to the demise of the English language. The word “everyday” is an adjective, as in “my everyday routine.” Otherwise, and in this billboard, it is two words, every day, just as in any day, some day or one day. You would not run these together, would you? The library is a sad commentary on mismanagement and ignorance, too. Literacy begins in the library and no library should be allowed to deteriorate to this point. A functioning, resourceful library is vital to any community. And, to ignorantly say there is nothing that can be done is inexcusable. I agree – fix it now! Just a suggestion to the powers that be – get a reliable contractor and no politics in the choice. I was glad to read about the efforts with Windsor. I will never forget visiting the ruins in 2008 and being totally unprepared for them as I came down that narrow driveway. Every effort needs to preserve them and the area around the site. They should move the library across N State St. to the beautiful concrete building. The building still feels like a Sears. Condensing space would be beneficial (too many vacant racks). New study carrels would also help – ask the architecture students at 509 to make some.